Earlier this week, I wrote the text below to a friend who has been experiencing some scary situations with male clients she works with as an addiction counselor. She felt scared and alone. After the mail bombs, the grocery-store shootings of two black people by a white supremacist, and the synagogue massacre–all this week–I felt I should share it here, slightly modified. The order that has been in charge for millennia, and perhaps most especially in North America for the last 400 years as a settler-colonialist, white, male, Christian, heterosexual, capitalist-extractive, “productive” force, is recognizing that their rule is being questioned and challenged now more than ever. Though in the past there have been movements and efforts to expand rights and seek equality, they have generally only “allowed” marginalized groups to mold themselves into the desired image of the system. But now many are choosing to live and express themselves as they are—and rejecting the prescriptive “norms” that have been provided. We want to be women as we value womanhood, femininity and the divine inside us. We want to be sexual beings as we are and express our gender in ways that help us feel fully seen. We want to explore spirituality, connection, religion, enlightenment, and wisdom from our ancestors and to learn from others across the world and to delve within our souls rather than passively receiving any traditions that denigrate us. We give ourselves permission rather than seeking it from others. We are learning to speak unashamedly in our languages, accents and dialects that share with others who we are and where our people come from. We pare down consumption in favor of creation and connection. We protect the water and the earth in the face of threats. We flee violence and persecution even when it means where we arrive may not welcome us, to protect our children and our futures. We declare ownership of our physical selves and demand accountability for those who have trespassed. We seek to know ourselves and be seen and valued by others for all that we are, truly. And as the old way dies a bit more with each person who stands in their truth, it is experienced by some as a threat. And they respond with fear, numbing, and sometimes rage and threats and outbursts and violence. Those who carry the light so clearly and fully–as my friend does–are targeted by the fearful. The fearful see that those who are tending their light have something that their soul deeply needs and they are angry about their perceived lack. They don’t yet know that they carry a light, too, and that it takes seeking and tending to bring forth. But not knowing their own light, in their ignorance they seek to extinguish others so we are all in the dark together. So they threaten and violate and rage and destroy. These behaviors are all symptoms of the larger structures in which live being on shaky ground. It’s a death rattle of the old world order and the birthing cries of the new world to come. We have to be strong for ourselves and for one another. And perhaps you may choose to take your light to a place where it can shine brightly in safety for a long while or just a bit and that is absolutely a valid choice. But I hope it helps to see yourself as not alone in this, but rather as part of a beautiful transformation that we are making—and that we must make—to move TOWARD a future that reflects our full potential to live in love and light and connection as a species of animals among all the other beings seen and unseen. Being you–your full self–in a world that seeks to diminish and destroy you IS AN ACT OF RESISTANCE. I’m here to witness and validate your struggles and your efforts to keep yourself safe but hope you are able to do so in ways that help you continue to evolve and expand and grow and shape yourself, the people around you and the world toward love. Sending love to all of you in this time of darkness. Shine your light. I hope this post finds you celebrating a fresh start to a new year! I spent some time yesterday writing a few new year post cards with a wine theme and Baby New Year stamps from 2000. The stamps have a face value of 33 cents–the going rate for a postcard until the increase on January 26th. I have been continuing to correspond, even in my absence from this blog. I had avoided the blog for a while because I had so many spam comments and my efforts at installing a capcha tool had apparently failed. So I shut off comments entirely and the spam ones sat there. This meant that none of you dear readers could leave a note. And, really, isn’t blogging about the conversations that happen as a result of what is written? Without comments–or at least the possibility of comments–the blog felt one-sided and sterile. I’m not a techie. At times I avoid technology altogether (there’s a reason why I am such an avid letter writer!). So I got really frustrated when WordPress froze every time I tried to delete the spam comments in batches of more than a 100. It was easier to just avoid the 42,000 spam comments than to try to figure out how to delete them so I could get the comment process back up and running. Recently, in the midst of my Christmas vacation, I had the energy and focus to sit and go through the cumbersome delete process 420 times! I did it! And I think I installed a capcha. So you should be able to leave comments and I hope the little math problem it asks doesn’t cause you too much trouble! It feels like I’m getting a fresh start on this blog as I approach its third blogaversary! So I’m making a New Year’s resolution to post more often, to share exciting news from the postal world and to effusively express my love of the handwritten and artful letter. If there is anyone out there who still reads this, I hope you’ll stop by once in a while and see what’s up here. Drop me a comment, it will only cost you an easy math problem to leave it! Isn’t it funny how creation can look so much like destruction ? But the results are nice! I just made some envelopes with a West Virginia map I had laying around. They go nicely with the new stamps celebrating the 150th birthday of my home state. Look at those gorgeous rolling hills. Country roads, take me home. Enjoying Memorial Day by making a little mail. However we celebrate, I hope we all remember and thank those who have served so we can. Another weekend with letter writing! Getting geared up for the summer postcard season. Every year the Washington Calligraphers Guild and the National Association of Letter Carriers hold The Graceful Envelope Contest inviting calligraphers and artists to take a theme and create beautiful envelopes. 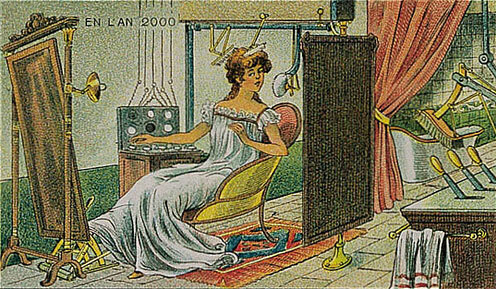 My Dad sent me a great link to 1910 postcards featuring illustrations by French artist Villemard. They depict how he imagined Paris in the year 2000. Some of his predictions were spot on (audiobooks, Skype, and email) but others are laughable now. Best of all, I love how they all involve demure clothing. No futuristic silver space suits here. These lovely images were found by someone at the University of North Carolina. I wonder if they were in an archive or some old family member’s collection. What a find! You can see all of the images in this Flickr stream. Wouldn’t it be great to have these images on postcards now? If you haven’t previewed what postage stamps are coming for 2012, go check out Beyond the Perf’s list. I have already added reminders to my calendar for the whole year so I won’t miss all the ones I love. My birthday is at the end of January and I’m going to treat myself with the year of the dragon (my Chinese sign) and bonsai ones out by then. The one nice thing about my stamp obsession is that it makes me write more letters and cards just so I can use them! Stamp photos from Beyond the Perf. Once they’re released, they will be available for purchase at your local post office or online at the Postal Store. What are your favorites in the coming lineup?